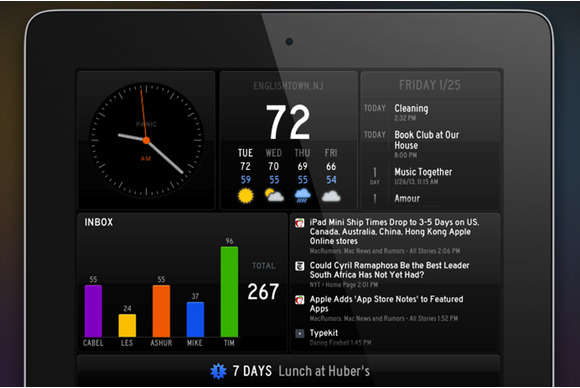 Panic on Wednesday unveiled Status Board, a new iPad app for displaying and tracking data. The $10 app’s inspiration was Panic’s own status board, which the company blogged about—and received countless accolades for—back in 2010. When you first launch Status Board, you’re greeted to a delightful setup assistant—styled after a consumer electronics manual—complete with its own musical soundtrack. Once you’ve gone through the setup process, you’ll get a default status board, one that mixes elements like a clock, forecast, calendar, and newsfeed. But it’s entirely customizable: Tap the gear icon at the upper left, and you can add and configure a variety of modules—including ones that pull from email (which require your IMAP account’s login credentials), Twitter, and more. Status Board lets you drag and drop different modules onto the screen, and most can be resized as well. I assembled a board with the local weather, a clock, a calendar, a calendar ticker with birthday reminders, a Mac news feed, and my inbox. Some elements have multiple ways of displaying information: a list versus a ticker versus a graph, for example. 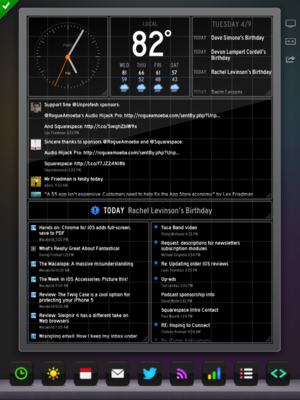 As it turns out, you can use Status Board to generate more personal screens, too—if you have the data to show. The app lets you drag in modules for charts, tables, and pure do-it-yourself efforts, each of which must in turn point to a host URL you provide. That way, if you decide to use Status Board to show a live chart of your company’s sales, or the number of days you’ve gone without a freak accident, you can. Panic provides instructions, accessible within the app, on how to provide the appropriate data sources. And a relatively new company called StatHat, which aims to make gathering data simple, is offering up Status Board-ready feeds, too. Panic is banking on the fact that some companies might want to put Status Board up on a big screen somewhere: To unlock the app’s TV Out or AirPlay functionality, you must pony up for a separate in-app purchase. The final price of that purchase was unavailable at the time this was written. 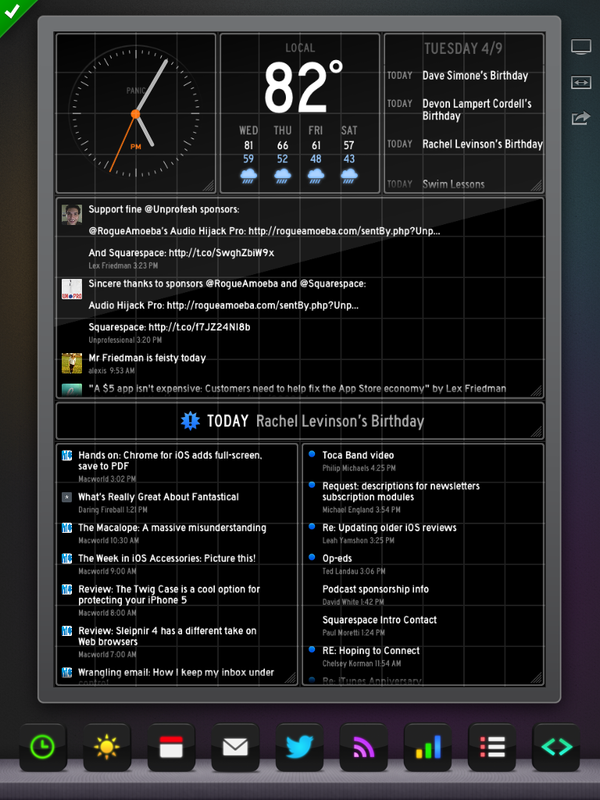 Status Board requires iOS 5 or later.